The design message resonates with a group of people—meaning it incites an emotional reaction from the buyer. The design is customized for a very specific niche—to the point where the buyer feels like the design was created just for them. (Or perhaps you are a content creator who already has a following? You may already have a unique logo or name/phrase you want to incorporate into your design. Check out the Creator Guide for design tips! What are Teespring’s most popular evergreen niches? 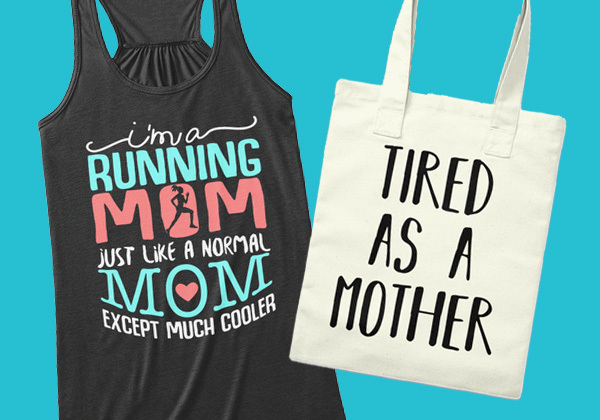 Design themes like jobs, families and pets are always popular on Teespring. The trick is taking these themes and adapting them for specific audiences. For example, you can customize a welder design by adding on different “layers” to the design message. Layer 1 (career): All men are created equal, but only a few become welders! Layer 2 (career & family): Some people call me a welder, the most important people call me daddy. Layer 3 (career, family, hobbies): This welder lives by 4 rules; don’t touch my tools, my guns, my beer & my wife! When it comes to new and trending themes like politics and feminism, the possibilities for customizing your design messages are endless! Another way to customize designs is by adapting them for new markets. For example, you’ve got a super successful “Softball Mom” design niche you’re selling in the U.S. Why not reuse this design for another market like the U.K.? Softball might not be as popular in England, but what about trying “Rugby Mum” for example? You can take customization one step further by translating your designs for new markets too—one of the perks of our Loyalty Program is free translations. We are looking to expand Boosted Network EU into new language markets and will begin adding German and Italian designs soon. If you are a content creator who already has a following, you may already have a unique logo or name/phrase you want to incorporate into your design. Check out the creator guide for design tips! If I have an idea for a slogan that could be used with various sports, how do I protect it from being exploited by others. Do I need to patent it? Hi Sonya – you can explore copyrighting your design for protection. Is there a possibility of re-ordering a shirt that I ordered early 2016? I ordered 2 shirts and a Hoodie with the following saying and symbol of Hawaii. The saying above and below the symbol “HAWAII IS CALLING and I MUST GO”! If available, I would like to place an order. Thank You! Hey Carol! You can reach out to support@teespring.com for buyer support 🙂 thanks! I am a designer and I have tried to use several colors and sizes on my shirts but I always get the error message that it is too many colors and/or too many pixels! Yet I see many tees on here that are very colorful and that are very full of pictures and words! I wondered how they do that! Can you tell me which software i use for more colorful design? Please..
Hey Vishal, a lot of our sellers use design programs like Photoshop or Illustrator. I have my products on teespring yet no sale what do you suggest for marketing strategy? I already tried Fb ads. I know that the products that I design is also said on amazon wallmart and etch. Is there a way for me to see it?